A salute to Jack Bryant, Veteran of the U.S. Navy for serving his country in WWII. Bryant is a resident of Heritage Assisted Living in N.W. Oklahoma City, OK and is 100 years strong. One of the residents at Heritage Assisted Living has been getting a little extra attention lately. Not only is he an all-around-good-guy but he has reached a milestone in his life. He is 100 years young! His name is Jack Bryant, a Navy Veteran who served his country in WWII. At age 14, Bryant moved back in with his parents. His folks moved several times over the years and he graduated from Classen high school in Oklahoma City, OK.
Bryant was in the Navy for 3 years. After getting out of the military, Bryant worked for B.C. Clark Jewelers here in Oklahoma City. “Ella and I lived in the Village area, raising 3 boys there. Those were some of the best times of my life,” Bryant said. Bryant is a kind, individual, storyteller that lived a good life and continues on. 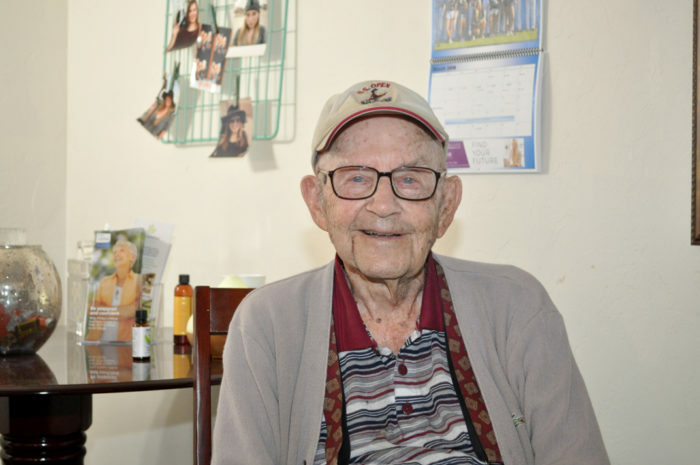 Serving his country in the U.S, Navy, Veteran of WWII, married to Ella for 71 years and enjoys spending time with his sons and their families as often as he can. Bryant has made many friends along the way and will continue to do so. A heartfelt thank you to Jack Bryant and all of the Veterans that served their country! You made a difference in our lives. Thank you!